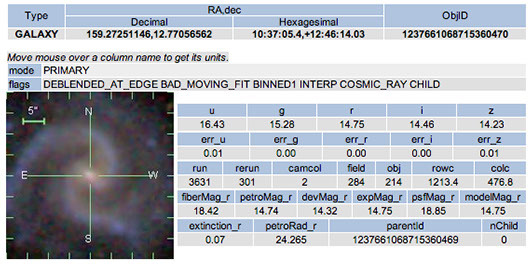 As a whole, the photometric block on the Explore page contains information about the images taken with the SDSS camera. Spectroscopic observations in the SDSS are separate from the imaging. The first two lines of information in the photometric block of the Explore page contain information related the brightness of the target and the reliability of that measurement. The SDSS captures images in five different filters (u,g,r,i,z) nearly simultaneously. Based upon the photon counts recorded in each filter, a magnitude is measured. Magnitude is the standard measure for brightness in astronomy and is unitless. The magnitude scale is also reversed, the lower the number recorded for magnitude, the brighter the object. Most objects in the SDSS are relatively dim objects compared with what we are able to see with the unaided eye ( up to 5 or 6 depending upon the sky brightness). Objects targeted for photometry in the SDSS typically range from 12th to24th magnitude. Below the magnitudes for the target object is a record of the error associated with that measurement. Procedures for calculating error take into account how well the photometry algorithms were able to measure the properties of the background sky and how cleanly the light from the target was able to be separated out from nearby objects. Error less than 0.05 indicates good quality magnitude calculations. Because there is considerable overlap in the photometric data, it is important to record the exact location of the data that went into a particular image. The same object maybe recorded elsewhere in the database. Whether you are looking at the primary or secondary record of that object or you are interest in veiwing the parent image of a deblended child, the third line of the photometric block records the photometric source that gave rise to the measurements recorded on this page. run – Refers to the original observation pass of the CCD. It contains single contiguous piece of sky. camcol – There are six columns on the SDSS CCD camera. This number identifies which of the six columns the data came from. field – For easier image processing the data is “cut” up into units called frames. All five filters in the same frame are called a field. obj – Within each field objects are numbered. colc – is the number of pixels to the center of the column on the CCD. Most of the objects in the SDSS are not simple point sources. As a result, different models can be used to measure the magnitude of a more dispersed objects. The model you favor, in any particular case, is based upon what you think the object is. Models for the light distribution over an elliptical galaxy are different from those that work best for blue spirals. The Explore page provides you with all the different model measurements in the r band so that you can compare the differences. The magnitudes listed at the top of this block of information are the model magnitudes which are good, overall measures of object brightness regardless of the source. If you decide, the other magnitudes in all the other bands can be retrieved by constructing a specific query. See SDSS Searches for more details. fiberMag_r – The magnitude as measured by the spectroscopic fiber. The optical fiber intersects 3 acrseconds of the sky. Although this standardized size is great frame of reference, objects larger than 3 acrseconds will be underestimated by this model. petroMag_r – The Petrosian model is designed to deal with the bright core and fuzzy edges of galaxies. devMag_r – DeVacouleur developed a profile for light distribution across elliptical galaxies. Using this profile model, a magnitude measurement can be assigned. expMag_r – Disk galaxies can be measured accurately using an exponential distribution of light from the center. psfMag_r – Given the characteristics of the system optics and information about seeing conditions gained from sky measurements a model is set for the magnitude of an object if it is a point source. This model works well for stars and quasars which are assumed to be point sources. The SDSS always attempts to fit the light profile to this model as part of the deblending process. modelMag_r – This measurement actually represents a choice by the analysis algorithms that decides if the exponential model or the deVacouleur model is a better fit for the object. This algorithm is applied in the r band then applied to all the magnitude measurements in all the other bands. extinction_r – For each object, the photometric pipeline estimates the amount of light that was not measured based upon the atmospheric condition for that image and filter. This is a magnitude measure. :arger numbers can be pointing to less than ideal seeing conditions. petroRad_r – The petrosian radius is the arcsecond measure of the aperture radius where the ratio of the average brightness to the brightness in a defined center reaches a certain threshold. This gives you a measure how dispersed the object is in the image. The final entry on the photometric block is a record of the results of the deblending process that separates overlapping or neighboring objects’ light. The parentid is the object id for the original image before deblending and photometric measurements were done on the object. When a parent id is presented is nChild should be zero. nChild is the number of objects were separated out from the object featured on the page. For more information see Flags – Deblending and Children.